Casting resins for electical applications, both flexible and rigid. CP25 is a decorative, water clear resin used to encapsulate objects. 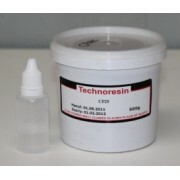 Can also be used to laminate or coat and doming applications. CP25 Clear Polyester Resin Resin: 500 g + Catalyst 10g Recommended Catalyst %: For 100g CP25 use 1 ml Catalyst (0,8 ml for larger castings). Use a pipette or syringe to measure the catalyst. Orders can be placed over the phone or by email. Delivery within 24 to 48 hours by courier. Th..